Log Other than having wings, this creature isn't very different from a Shady Koopa. Once it flips off its back, it boosts its Attack. That's a Shady Paratroopa. It's a Shady Koopa with wings, obviously. Max HP is 8, Attack is 3, and Defense is 1. 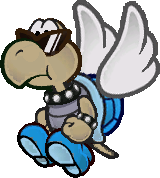 Knock off its wings and it's a Shady Koopa. Unlike typical Koopas and Paratroopas, its Attack jumps when it flips up off its back. This also says it has a move that hits you and your ally at once. Is that possible? Uh... I guess the best thing to do is just beat it quickly after we flip it. Shady Paratroopa (or S. Paratroopa) is a Koopa Paratroopa with a blue shell and slightly darker skin pigment. It appears during the events of Paper Mario: The Thousand-Year Door. Only one appears in the game as one of Mario's opponents in the Glitz Pit, along with two Shady Koopas. When they are stomped back to Shady Koopas, they can even attack on an upturned shell. Urapata Ura means the underside. Patapata means Paratroopa. Shady Paratroopas were planned to appear in Super Paper Mario, as they appear in the game's files and are capable of swooping towards the player, unlike other Paratroopas in the game. This page was last edited on August 2, 2018, at 18:00.